The Democrat's rivals for governor say the mechanisms for welfare oversight already exist. AUGUSTA — Democratic congressman and gubernatorial candidate Mike Michaud is proposing a new state agency to combat waste, fraud and abuse in public welfare programs while independently monitoring the performance of the Department of Health and Human Services. His rivals in the race for governor quickly criticized the proposal as an unnecessary expansion of government. 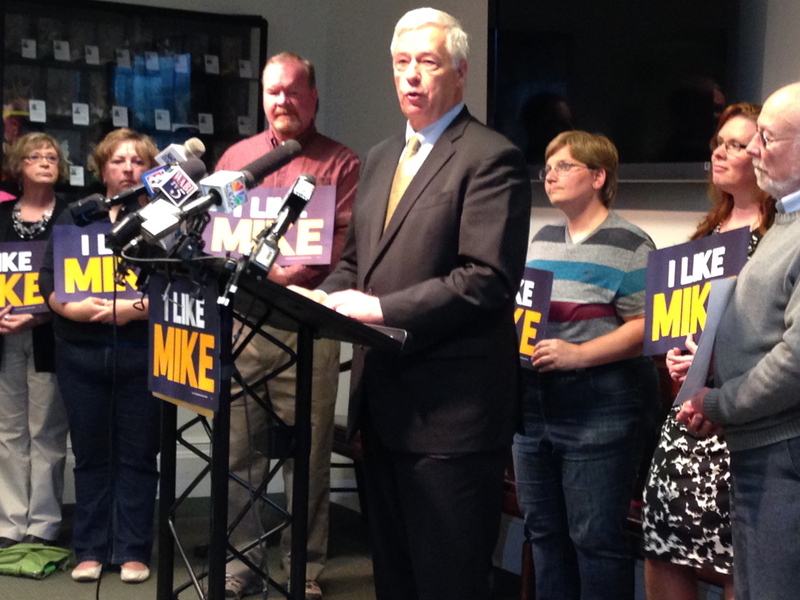 Michaud’s proposal, unveiled at the State House on Thursday, took direct aim at Gov. Paul LePage, who has made welfare fraud a central point of his campaign and his legislative efforts last session. Michaud also framed his welfare plan in the context of several controversies that have occurred at DHHS during the governor’s first term. Michaud, who is in a three-way race against LePage and independent Eliot Cutler, said the governor has over-politicized welfare fraud while doing little to prevent it. Under Michaud’s proposal, the Office of Inspector General would oversee fraud investigations independent of DHHS. The new agency would also oversee program integrity and efficacy within the DHHS, review and ensure transparency in department contracts and make recommendations to improve program administration. The inspector general would be appointed by the governor to a four-year term and confirmed by the state Senate. The confirmation process would be similar to that of state commissioners, but they are not assigned to four-year terms and serve at the pleasure of the governor. The proposed inspector general could only be removed for cause. The new office would include the existing fraud unit, which has an annual budget of $1.5 million, and five new positions at an estimated additional cost of $578,000 a year, according to Michaud’s campaign. But Michaud’s plan to create an Office of Inspector General to oversee an agency that spends $3.4 billion a year was quickly criticized by his rivals’ campaigns. Adrienne Bennett, LePage’s spokeswoman at the governor’s office, said the plan is not feasible given the state’s resources. Brent Littlefield, the governor’s campaign strategist, criticized Michaud and Democrats in the Legislature for rejecting LePage’s proposals this year to reduce the misuse of electronic benefit transfer cards used to distribute cash assistance. Littlefield also framed Michaud as an out-of-touch politician who did not share the governor’s experience with poverty. Littlefield called Michaud’s proposal “outrageous” and tied it with the ongoing scandal at the U.S. Department of Veterans Affairs, which was uncovered by the U.S. Inspector General and the media. Michaud is the ranking Democrat on the congressional committee that received the OIG reports. “Just recently we discovered Michaud ignored years of Inspector General reports on the problems at the VA,” he said. Cutler said the proposal to expand government reflects Michaud’s experience in Congress and as a former state legislator. “Apparently when you’re a member of Congress the only thing you learn when there is a problem is to create another state agency,” he said during a phone interview. Cutler said Mainers don’t just want problems of welfare fraud investigated, they want them solved. He noted that the state Office of Program Evaluation and Government Accountability’s (OPEGA) work plan includes a review of DHHS fraud investigations. Cutler also cited the ongoing controversies at the DHHS and said there is a lack of accountability in the LePage administration. During his press conference, Michaud at times forcefully criticized LePage, saying the governor had demonized poor families and taken the serious and complex issue of poverty and politicized it. “That is wrong,” he said, jabbing a finger at the lectern. In 2012, LePage and the Legislature approved an additional $700,000 in annual funding to pay for eight additional fraud investigators within the existing anti-fraud unit in the DHHS. Last year, the administration touted an increase in case referrals to the Office of Attorney General, which prosecutes welfare fraud. However, the increase in restitution recovered was marginal, from $92,339 in 2010 to $104,341 in 2012, critics said. The Maine Legislature currently has a watchdog agency known as the OPEGA. That office has led several high-profile investigations, including a review of the Maine Turnpike Authority that led to the criminal prosecution and jailing of former director Paul Violette. More recently, the agency has investigated allegations of document shredding and the manipulation of $4.7 million in public health grants at the Center for Disease Control. In introducing his proposal, Michaud cited the CDC case, as well as several other controversies at the DHHS, including an ongoing non-emergency medical rides contract marked by at least $2.5 million in additional payments to an under-performance broker; the loss of federal funding at the state’s Riverview Psychiatric Center and a no-bid contract to a welfare consultant whose reports included several incidents of plagiarism. Michaud said that while OPEGA provides valuable oversight and investigations, the small agency is ill-equipped to constantly monitor the bureaucracy at the health and human services agency. Other states have agencies similar to the one Michaud is proposing, including Massachusetts and New York, where both agencies oversee and investigate the activities of several state agencies. Michaud’s proposed office would only oversee the health and human services agency, the state’s largest in terms of employment and programs. Arkansas created a similar oversight unit when it expanded Medicaid enrollment under the Affordable Care Act. Welfare – and welfare fraud in particular – will be a key point of debate in the race for governor. LePage, sensing the popularity of the issue, has made it a central point of his campaign and his legislative efforts last session. Democrats in the Legislature opposed his proposals as ineffective, costly and harmful to poor Mainers. However, Democrats, particularly those in swing districts, know that they are politically vulnerable on the issue. During the last session, the Democratic-controlled Legislature killed or watered down the governor’s welfare proposals, but not before engaging in several parliamentary votes on compromise amendments that could provide swing-district members cover in the upcoming election.